SE 245 - Black, LP-Shaped Guitar from PRS belonging to the SE 245 model. This PRS SE 245 guitar is built in Korea. It has a mahogany body, a maple top, a mahogany neck, and a rosewood fretboard, with 22 frets and 25 inch scale. The hardware is all PRS proprietary, designed after the USA models and identical in appearance, yet different in metal composition. 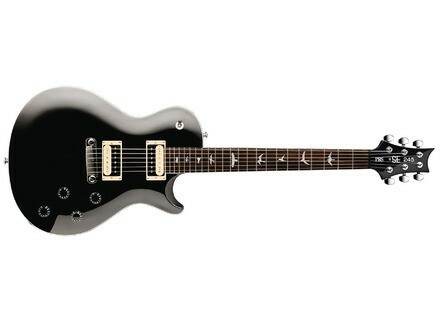 The pickups are PRS 245 Treble and Bass humbuckers, and there are 2 volume and 2 tone knobs and a 3 way, like a Les Paul. This is a very nice instrument. I've played the black one (which I'm reviewing here), and I've seen pictures of the sunburst ones - the sunburst ones have a much nicer looking top. The black finish is expertly applied on the one I'm familiar with, but I would have rated the guitar higher if it had the nicer flamed top like the sunburst. The guitar plays very well! It is obviously inspired by the Les Paul, but with the Paul Reed Smith distinctive shaping. It is quite well made, and the fretwork is some of the best I've seen in this price range. The guitar balances well, and it is easy for my hands to reach all the frets. These pickups sound great! The treble pickup really cuts through, but it is not too hot. The neck pickup sounds very warm and open, and that nice "woman" tone (like Slash or early Cream) is really easy to achieve. This guitar will do about any genre, excelling at rock and blues-based styles. This is a nice choice for someone on a budget, or a pro that needs a backup for their more expensive main guitar. For the pricing, this offers a lot of style, playability, and tone. Check it out - it's worth a look if you find one in a store near you.